Over the Thanksgiving break I took the opportunity to enjoy some warmer weather and take a series of sunset photos. The clouds were ripe for a great sunset, but just before the sun went down the wind had a different idea. The wind picked up and cleared out what was going to be a very colorful sunset and left with this little band of clouds. I attempted to do things right in camera and not use HDR for this sunset. I used a 3 stop hard edge neutral density filter since there is practically no elevation differences in the landscape of the northern plains to even out the exposure. I then transferred the files into Photoshop after my usually adjustments in Lightroom and added an LAB processing effect to the photos. LAB processing brings out the natural oranges in the photo and adds to the saturation without degrading the image. I toned that layer back to get the sunset the bright orange that I experienced that night. I put the sun in the center of area toward the bottom third to get the most amount of sky possible and to crop out the farm buildings to the right side of the photo. I normally would include those in the photo, but these wouldn't have added to the photos. This photo was taken just a minute or two before the very top photo. To see the difference in LAB color effects and regular process scroll back and forth between the two. 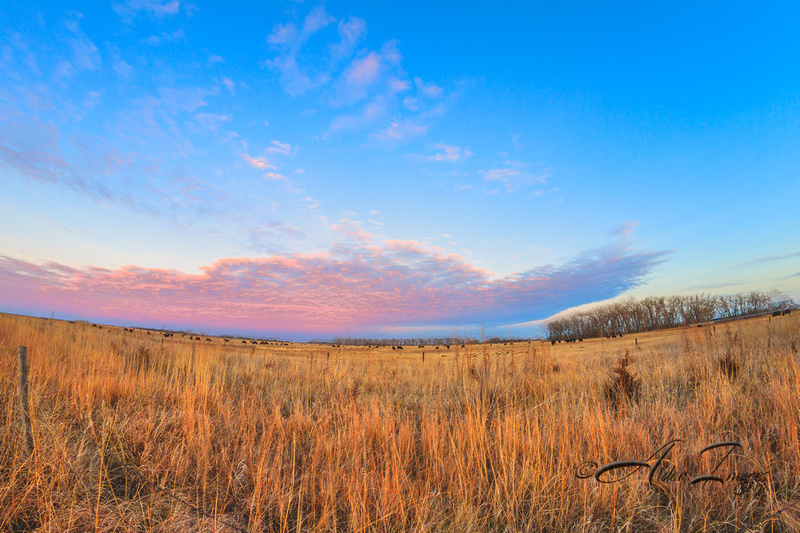 I cropped the other file to a 16:9 ratio because I didn't like the fence line in the photo below. These were the clouds on the backside of the sunset. I thought these would stick around long enough, but again, the wind had a different idea. I took this photo with my fisheye lens and marginally straightened the horizon line in Lightroom.